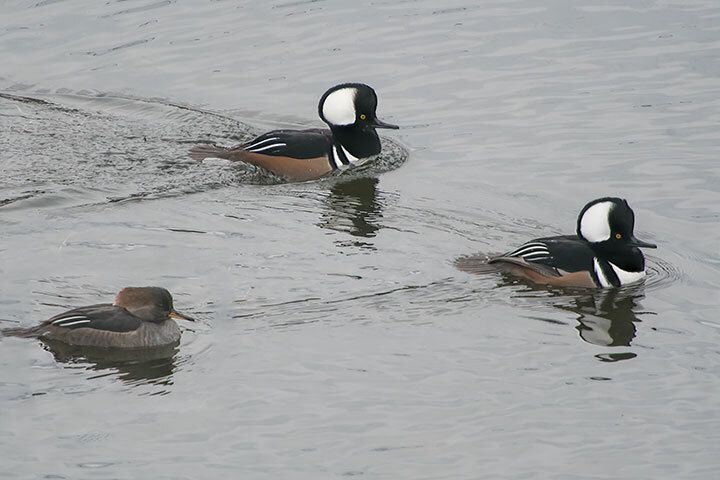 It is November and the Hooded Mergansers are courting. This may seem a tad early for such an activity, but hoodies form their pair bonds in the late fall or early winter. First, we need a base-line look for the pair when it is not courting. 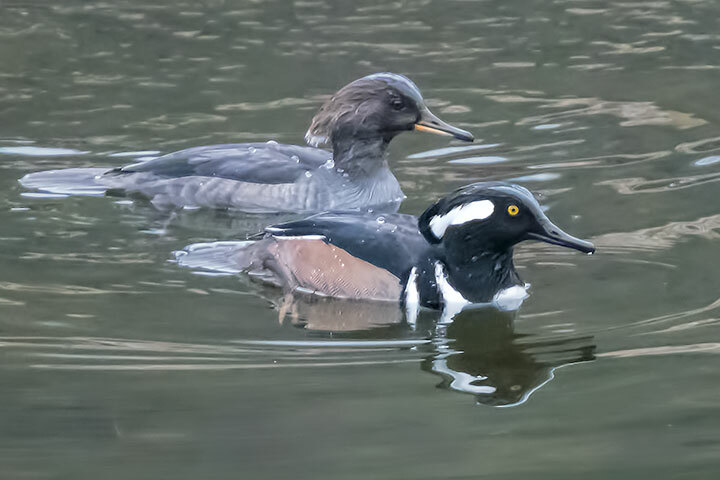 The male is on the front right and the female on the back left. The feathers on their heads lie flat. This picture was actually taken when the pair bond seems to have been established, three days after the following shots. Two males were circling and competing for the female. 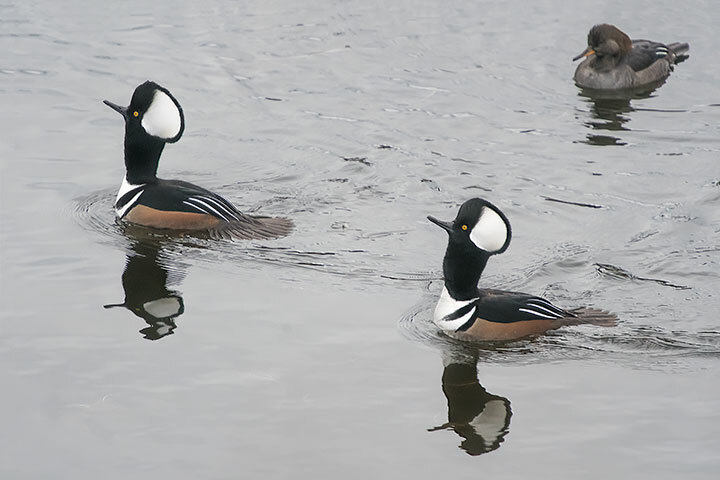 Each male has erected the crest on his head to show his interest in her. This is probably also a show of aggression towards the other male. Here, the female has not responded by erecting her crest, but she does so after a while. Hoodie males show even greater enthusiasm by doing head pumping whereby each silently extends and shortens his neck. Typically, the bird does not face the object of its desire, but presents her with the more enticing side view. 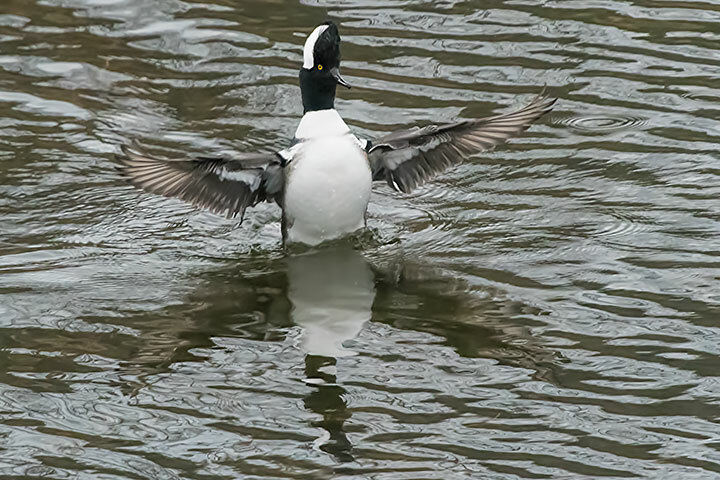 Occasionally the male will rise high in the water. 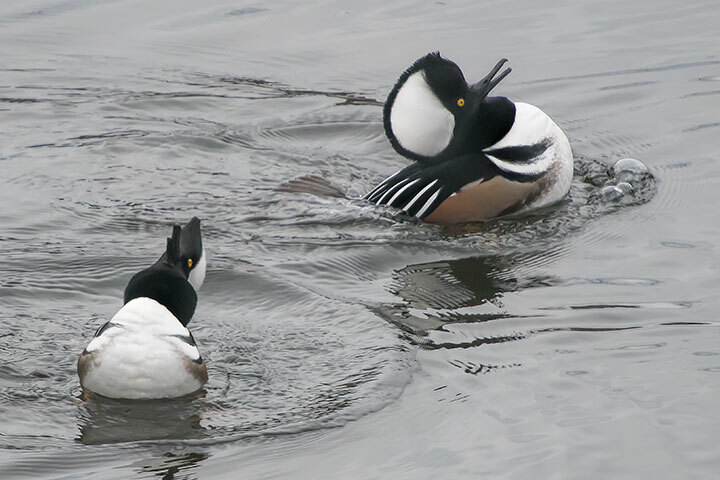 However, in the most elaborate of the male courtship displays, he keeps his crest erect, throws his head right back, and calls. How could she possibly resist? I am learning so much and am completely blown away by all of the photographs and accompanying explanations! Thank you!! The best birds & bees demonstration I’ve ever enjoyed…thanks, Alistair!!! Thank you Alistair for the explanation of the Hoodie’s display and the awesome pictures to go with it. We all learn so much from your Blog & are so appreciative of your hard work.